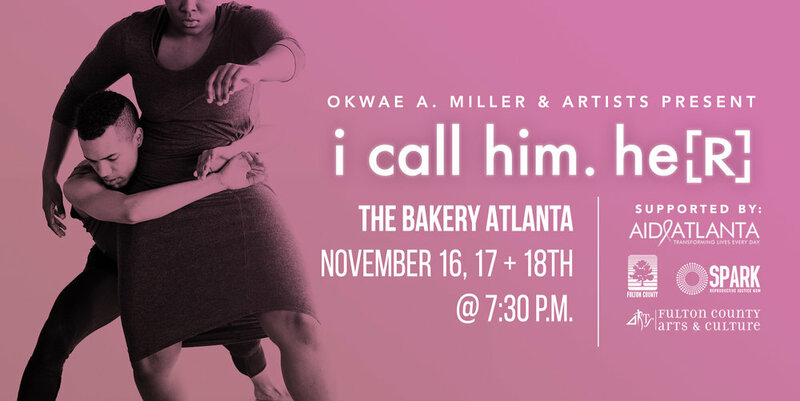 The company Okwae A. Miller & Artists may only be a couple years old, but they are already shaking up the Atlanta dance scene. Okwae was a familiar face at the WORKROOM, Atlanta’s former hub for contemporary dance. With a dedicated team of dancers and performers to back him, he is making a name for himself performing at spaces such as The High Museum, The B-Complex, and next up, The Bakery. We picked Okwae’s brain to ask him about his next research-based project i call him. he[r] which focuses on the role of black masculinity, particularly in the lives of black gay men. The show runs from November 16th through 18th and tickets are available here. What does this piece aim to show or challenge about black masculinity and sexuality? Overall, we are acknowledging the normality of maleness and heterosexism as the guide for our lives and, with this succulent trio, we are crumbling that formula and being proud about it. Yes, it is okay to be gay. Yes, it is okay for men to dress of in drag. Yes, it is okay to transition. A lot of people are unfamiliar with how research works in the dance world. Can you talk about what your research process looks like? What transforms scholarly investigation into movement? So, my research varies from project to project, but I tend to start with a vision or concept. Much of the research I am doing now, involves an intense amount of literature review, collection of personal narratives, open dialogue, public observation and experimentation. In the studio, we use several choreographic/composition techniques to generate movement and build the narratives around that movement. I often review research materials and examine how the body responds and connects to personal history and identity to create a choreographic phrase. Additionally, the dancers are key in the investigation process, as they are applied a series of experimental tasks to complete and build the work chunk by chunk. You are no stranger to morphing an environment to create a new home for your work to live in. For example, your work The g[R]ay Boi at The B-Complex in May featured maze-like walls as well as unconventional seating that spread out the audience. This next project is created for The Bakery, a dynamic space with its own transformative abilities. What is your relationship to the space and how does it inform the work? This will actually be the first time working in this performance venue, but I do have a genuine interest in presenting work in unconventional workspaces and The Hanger at The Bakery was perfect. I think there is something very challenging and satisfying about building the creative space within your artistic vision. Although, the traditional performance stage offers some convenience, being in a DIY-space offers much freedom. For example, the sky is the limit with the lighting possibilities and love working with Noah Hill (Lighting Designer) because he is definitely key in making that atmosphere and mood come alive. Additionally, the arena style seating breaks the fourth wall allowing audience interaction and a more personally connected experience with the dancers, movement and concept. In fact, much like The g[R]ay Boi, audiences are encouraged to and will have the freedom to take a seat or migrate throughout the performance. What’s it like being able to collaborate with the same trio of dancers for so long and watch the project evolve and grow over its many iterations? So, while I call him.he[R] continues as a trio, casting has actually changed a little for this project. I have continued to work some familiar faces, Benjamin Stevenson and Lyrric Cosby Jackson, and we’ve had the pleasure of welcoming Latina Rowe to this process. Artistically, I develop project-based work, but working with a new artist has definitely introduced the possibilities. Evolving from The g[R]ay Boi, which casted two men and a woman, to this new work that has two women and one man has introduced new ideas regarding personal identity and artist activation-investigation to connect choreographically. For instance, the dancers are navigating many identities throughout the duration of the work from being a woman to wanting to be a woman, but also the rejection of one who identifies against the heteronormativity. What’s got you most excited about Atlanta’s current dance scene? I am just excited that the dance scene is growing and there are more artists making Atlanta home-base with new ideas and perspective. Also, the appeal to collaborate with newer artists within the dance world and across different mediums. Nicholas Goodly is an Atlanta poet and the Writing Editor of WUSSY MAG.